We need a name! I was thinking “Uni Tool Productions”, but screw that! Also, we need some testers for our maps. We need some people that are at least as good as us (basically everybody =). They must also be willing to give some feedback. My map, Pipe Dreams, is almost done. I have the bases complete. I just have to add the rooms in the middle. This should be fairly easy. It is almost ready to put on the server. After Tool and I get done with our current maps, we are planning on working on a map together. There is only going to be ONE flag room. A clipping brush (sort of like a window) in between. That is all the details that I am going to give out. Pipe Dreams is almost done! Just one more room to go =) In other news, Cool’s first map, Court Battle, has been released! You can download it, or you can look at it and then download it. As soon as this one server gets set up, it will be put on there. Cool started on his next map! He wouldn’t talk to me all day, so I am guessing he got quite far on it. He gave me an idea, I drew him a picture of how he could do it, and it looks like he is building it. It was going to be a joint project, but oh well =) I’m sure I can think of something for a map. As you can see, it looks like he went kinda horny on the colored lighting, but that’s good for OpenGLers! I’ll have to see how it works out in Software mode (sniff, sniff). But this weekend, I’m getting a V3! So if Pipe Dreams isn’t released by then, I will have time to tweak the colored lighting. I’ve already decided on my next map! It will be a mines style level, but CTF! I was looking through the textures for a door today, I realized that there is a buttload of rusty style textures! So that is going to be the majority of them. Arrgh! I downloaded NetScraper last night, and it is so ugly! It’s also incredibly stupid. So if you were viewing this site with NetScraper, chances are that most of the pictures and links didn’t work. Well, I fixed them. But that still didn’t help how ugly it looked. The scrolling text didn’t work. None of the tables were right. So I’m going to get one of those “Internet Explorer” optimized thingies on the site. The Donut Trick worked! I finally got to test it! I was letting Cool compile my map, but it seemed to screw everything up. But I left my machine on overnight and compiled it, and it worked great! Colored lighting rules! Ok, I don’t have an acceleration board yet, but you can still get colored lighting in software mode. Don’t believe me? Ok. Just try this. THIS ONLY WORKS IF YOU DON’T HAVE A 3D BOARD ALREADY! Turn Default OpenGl on in Video. IT WILL FAIL. Type “gl_allow_software 1” in console. Turn Default OpenGl on in Video again. IT SHOULD WORK. Before gl_allow_software After gl_allow_software Before After I found that this best works in 320×240 mode and you are already currently in a map. This is a great way to have Softwarers test their colored lighting. BUT, on my 166 in 320×240 full size mode, I got less than 1 FPS. But it makes you want a board even more. I never realized how beautiful Outlands II or Court Battle were! I also realized how much better texture lighting is. On my next map, I will use texture lighting much more often! Also, I found that some of the lighting in my map is pretty ugly =) I don’t know how much time I will get to fix Pipe Dreams tonight, because I will probably be installing my Voodoo 3 board. But, you should be happy, because I will be able to see the colored lighting much more clearly. And I will be able to change some of the screen shots =) Trust me, some of the new rooms look way better. Cool Tool’s next map sounds like it is coming along fine! I still thought his last map ruled! But I guess he wasn’t happy with it. But he is sending me screens tonight! It should be awesome! If he did his textures as well as he did last time, I think it should be not only great looking, but great playing. Court Battle was both! His “trashed” map was good-looking, just maybe too slow for online play. But I don’t know how many times I had to fix my map! Oh well, Cool’s maps are getting better and better. It’s amazing how much he works on them. I try to ICQ him, and I get a reply like half an hour later. An update? Sorry, been busy lately. Mostly, trying to get a complete compile of Pipe Dreams. It’s like Windows 98 is a curse or something. I almost get done with the QVISing, and it crashes! I had a bad day where it crashed four times! Well, I got the QVIS done, just have to QRAD tonight. Argh! Oh well, once I get this compile done, it should be perfect. Cool has compiled my map many times. First time, brush was screwed up. Second time, his computer did the weird thing where you can see all the things you aren’t supposed to see. So, I decided I better compile it myself. HA! It has crashed so many times, it’s not even funny! Oh well, tomorrow I’ll finally let the beast out =). Tunnel Vision, Cool Tool’s latest map, has been released! This one was out of the blue. All of a sudden, one day from Cool Tool I got an ICQ saying something like “Hey, I think my map’s done, wanna test it?” I was like, “WTF? That was quick!” It took about a week for him to get everything ready! We were gonna have a dual release, but Pipe Dreams kept getting screwed over with the compilers! Download it and have a blast with Eraser, or if you are gonna run it on a server, email me! We’ll put your IP on the servers page PDQ! Oh yes, if you have downloaded Court Battle please download it again. We know this is an inconvenience, but Cool Tool has fixed a bug. More stuff about me =) Pipe Dreams is finally released! I know I’ve been telling you, “It’s coming out soon, tomorrow, blah blah blah.” Well, it is finally out =) The only play I can recommend is Eraser or a LAN party. It is a blast to play on. It’s just the size of the file that worries me to put it on a server. It is a whopping 2.65MB! It’s all because of the big open space around the bases. Oh well. I did learn a lot from it. I have start development on Forgotten Mines (working title). So far, all I have is the blue flag room, in a VERY early beta, that’s why I haven’t put any screens up yet. It does look like it will be much better than Pipe Dreams. Should be much smaller (file size =) and have much more detail. As I promised, there are two new maps for download! Beam Me Up Scotty! and S.S. Fragger are both available for download. Go to the download page to grab them. They are small downloads too. Go download them, have a blast with Eraser or a LAN, or if you are going to run them on a server, email me! Ok, first of all, I am going to explain Beam Me Up Scotty!. It is a deathmatch map targeted for 2-4 people. I played it with Eraser with 8 people, and still had a blast. But there was a lot of frags where you just barely spawned and then died =) I wanted to make a DM map that had non-stop action, and I think I have achieved it with this map. With Eraser, there was never a dull moment. I even got to test it online. There was a lot of mid-air rails (by me, because I had 25 ping =). So you can see why it would be good for a LAN. If there is a server out there that doesn’t have too many clients at one time, this is also the map for you. It would be an incredibly small download, less than 300k (unzipped!). Ok, I’m gonna stop blabbering about my map, and talk about the Tool©’s new map, S.S. Fragger. This has to be the best CTF map I have ever played, and I am not kidding. The item placement is perfect, that’s probably why it is so fun to play on. It also just looks so darn cool! It’s set in a spaceship. Construction is superb. The bases are probably my favorite area. Well, no, probably the quad (cause I spend so much time camping it =). The quad room has got to be the most creative room I have seen in a long time. Well, what am I blabbering about? Go download it! Just a quick update today. No new maps =( In fact, the Tool©isn’t going to be working on a new map for a few days. He said he needs a few days to get some ideas. Oh well, when he comes up with one, it should be awesome =) Oh yeah, Way Cooler CTF is running S.S. Fragger. This is very good. Way Cooler is ranked the 9th most popular CTF server on The CLQ. It is also on [fCo]WILDCAT’s server. Their IP addresses are both on the servers page. Well, it’s been about a week since I last updated, not much new stuff going on. I have started on a CTF map for the SOG Mod. It’s cool, because I get to mix some Wolfenstein 3D and Doom themes in with Quake and Quake2. It’s looking good so far, it’s just interesting what little detail those early games had. Hopefully this map will turn out to be as good as the mod =) I’ve been going around the site and fixing a few things. I fixed the scrolling text so that it would work with Netscape. But to show you just how much work it was I changed the Internet Explorer banner =) But Netscape still needs to get support for colored line breaks and colored table borders. Also, I have started archiving the news. I probably should have started a lot earlier. I am also working on setting up The MadMapper Message Board. It is up, I’m just fixing graphics and things like that. To tell you the truth, neither have been working on maps very hard lately. We have been playing lots and lots of Quake 2. I decided that I needed some “inspiration” from playing. Well, no inspiration, but lots of fun =) The Tool has been getting pretty good lately. He *almost* beat me in a 1-1 =P I joined clan dNd to get some OGL play. So we have had lots of practices and it takes up some serious mapping time. Well, we both have learned a lot this last week. Cool Tool has been improving on his Quakin’ skillz, and I have learned a few new tricks. It’s all a conspiracy! Actually, it’s ‘fake lag’. Many uses, just be careful. To the left is my “Kianu Reeves” impression. Not that I would want to be him, but it is a Matrix sort of move. This is taken straight out of my configs: alias freezeon “set cl_maxfps 0;bind HOME freezeoff”, alias freezeoff “set cl_maxfps 90; bind HOME freezeon”, bind HOME freezeon. If you want it to a different key, just change all the HOME’s to whatever key. Also, if you are an LPB, you probably have a higher cl_maxfps, so change the second one. Well, eventually we’ll get to another map. Cool said he has an idea for his next, and I’m “working” on the SOG map. But you gotta realize, there’s no point in making a map if you don’t have good ideas, otherwise, it will turn into crap. Well, good luck with that “Matrix” bind, I have found a few uses for it, but I’m not telling you. Hopefully we’ll have about 8 new CTF maps, and maybe a few DM before the year is over. Ok, I am really pissed! My brother uninstalled Quake 2, and then deleted the folder, along with running away with the disc. Basically, all the source for every map I made is now gone. That includes Beam Me Up Scotty! (it was a spin off of a map I was making for SOG), along with the CTF map I was making for SOG. Also, the few things I had done on bmwctf2 is now gone, and Pipe Dreams’s source too. The kicker is that he also uninstalled BSP, my map editor. But it doesn’t matter, because I can’t get to the pak0.pak file (he took the CD). Not to mention my mods, configs (that REALLY pisses me off), and everything I have ever contributed to Quake 2. What really torques my muffin is that I can’t play at all, not for my clan either. He also took Rainbow 6 and Half Life, so now, I am totally bored. Ok, on to the actual news (I guess that I won’t be able to work on maps for the next little while was news though), The Tool©has released Court Battle, yet again! I guess, Way Cooler didn’t like the download times on S.S. Fragger, because they stopped running it. Anyways, Cool Tool asked them if they were interested in any other maps, so he sent them Court Battle. They said it was good, they just wanted one change before they would run it, so he made it. Anyways, you’ll have to download it again if you are planning on playing it there. Or anywhere, I guess =) And I think it looks cooler too =P (he sent me a screenshot, of course ;) Anyways, hopefully I’ll be up in the map making biz again soon. Happy fraggin! I haven’t talked to the Tool much lately, but I haven’t been on the computer that much either. Hopefully he’s at least is getting ideas. It looks like Way Cooler CTF is still running Court Battle, so they must be getting some good feedback. Hopefully we’ll get some new maps out. What do you want, CTF, DM? Please go to the polls page and vote! Wow! An update! Two updates in less than a week, I’m on a roll! =) Actually, if this new news sounds correct, there should be even more updates in the future! Basically, the admin from Way Cooler CTF said that Court Battle has been getting a fair amount of play. He also said that he could use some more DM maps for Cooler, his DM server. So, basically, that should be a motivation to get some DM maps out soon! Keep checking out for updates, they’ll be sneaking up on ya! In other news, we have hit the 1000 mark! Yay! I was getting onto the page the check out the polls, and to update it, and a big ole number 1004 was peeking out. Thanks for all your support! Oh yeah, my ISP isn’t blocking my site anymore, so I can see it, yay! Anyways, just thought I’d let ya know that there should be some DM maps, or at least some screenies in the near future! I haven’t been able to edit much lately (because I still don’t have the textures, or sounds, if you know where I can find them, email me! ), but I have been learning website stuff. Within the next week, there should be a fancy schmancy shockwave menu on the left. It’s looking good so far. I also should be touching up the site a little bit, until I can start editing again. I’m also thinking about opening a new Q2 site, that deals mostly with all the special moves you can pull in Q2CTF. I have been learning lots of little tricks lately. 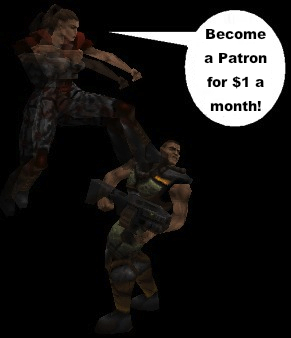 If I do, I’ll probably get it hosted on Planet Quake. Anyways, hold on for screenies of our next generation of maps! This new map has no name yet but looks way cool. I have put it on the fCo server for testing . Any good ideas for a name should be sent to me. Oh! And some more cool news. Court Battle is playing yet on another server. This latest one is -=http://sentry.clan-qss.com=- You got to go see their site. Its GREAT! In other news, The Cooler and Way Cooler servers have been taken off line. :( You see, Atrophy (the admin/owner) completed his Phd. (Way to go!) and is off to attack the job market. All that and he was one of the best admins in the cosmos of servers out there. In fact, SO good that he received “ADMIN OF THE MONTH” at PlanetQuake !! So please, a moment of silence to say good bye to the Cooler & Way Cooler servers and a BIG thumbs up to Atrophy. You WILL be missed!. . . . . . . . . . . . . . . . . . . . . . . . . . . . . . . . . . Ok! Heads up. To the upper-left, you will see a screen shot of one of the bases in the new map. At this time, B_CTCTF4 is in the beta stage. Basically, I need people to grab it and go play it and than report back via email what ya think and what the hell to name it :) After I get back enough ideas, I’ll make the changes and pick the name that best fits the map. Anyway.. Happy Halloween!! <o>^<o> Happy Fragging! !